Download Tring ( beta ) App & Get FREE Rs. 123 Credit To Call Anywhere in the world, It lets you make low-cost calls to any mobile or landline and high quality calls using your high-speed Internet connection (Wi-Fi or 3G/4G). Your first call is FREE! 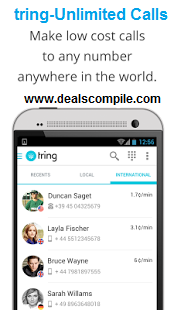 Download Tring now and make your first call for free. No credit/debit card required for the free call.